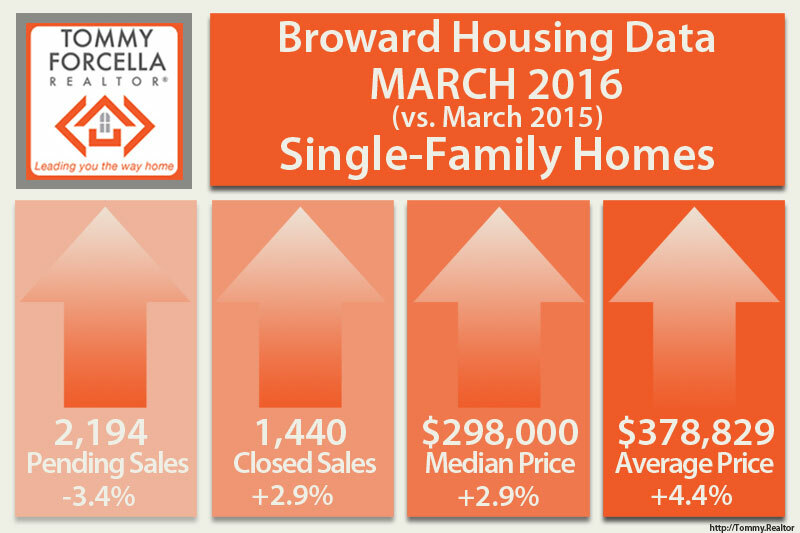 The Fort Lauderdale/Broward County real estate market continues to thrive through the 1st quarter of 2016. Single-family home closed & pending sales are up over last year and the prior two months of 2016. The median price of single family homes has gone up over 2015, but it has fluctuated the past 6 months with an average median sale price of $289,000. All cash sales continue to drop, with 13.1% less than in March 2015. With the reduction in short-sales and foreclosed homes, opportunities for investors paying cash are less frequent. This number is also a factor of the reduction in single family home inventory over the past 12 months. Active inventory is still hovering around the 4 month supply level, keeping sellers in control of the market and pricing. There are 9.2% less homes on the market than in 2015, and 2.9% fewer homes on the market from February 2016. Homes are going into contract quicker ( 49 days median time to contract ), and time to closing is also shorter than last year ( 99 days median time to sale ). The condominium market seems to be improving somewhat. New procedures by some lenders are now allowing for purchases with 20% down payment, as opposed to 30%, and certain litigation issues that would immediately disqualify borrowers from a loan are now being passed by the loan processors. There was a modest 5.4% increase in the number of condos sold from 2016 to 2015, but there was a 41.5% increase over February 2016! Median sales price is hovering in the mid-130’s and time to closing is improving with Median Time to Sale of 103 days. The strong market has bolstered developers who are now building condo and townhouse complexes throughout eastern Fort Lauderdale. East Side Village, Urbn Village, Velero at Sailboat Bend, The Reserve at Edgewood are just a few of the new development projects available. You can read and download the March 2016 Real Estate Market Report for FREE.